Many Dutch immigrants fought during the American Civil War. See the American civil war-article on Wikipedia for background information. 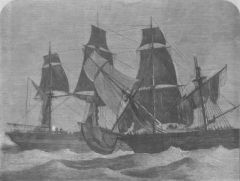 Passenger of the Ocean Home, an emigrant ship that perished off Lizard Point en route from Rotterdam to New York on September 5, 1856. 77 people drowned, some survived. On November 21, 1847, the propeller Phoenix perished on Lake Michigan, a couple of miles off the shore from Sheboygan. About 250 people died and only 43 people survived. Most of the passengers were Dutch immigrants. See Yvette's Dutch Genealogy Homepage for more information about the disaster.